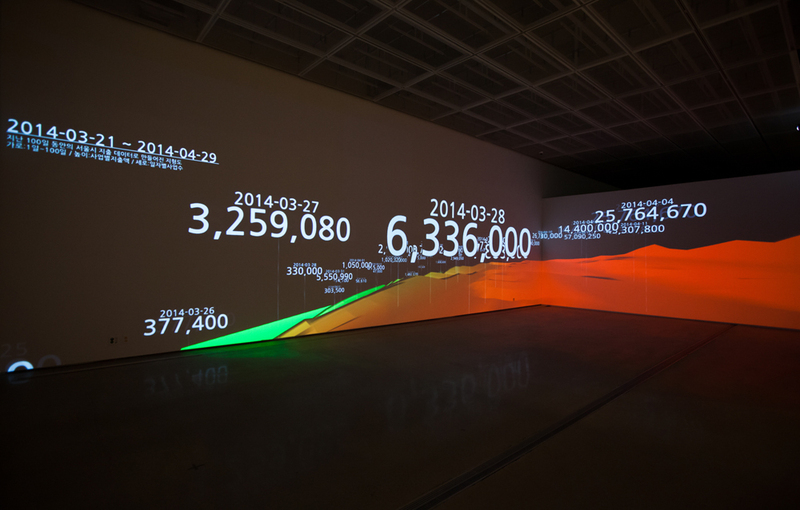 Does public data enable us to read and picture our city? If so, which data sets and media are appropriate to interpret city? 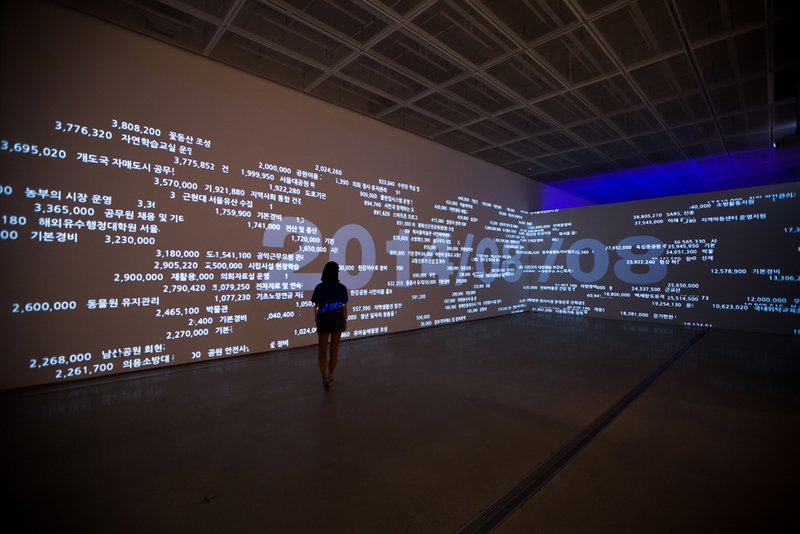 Can public screen be a civic media to increase public awareness? Statistical data tell us a much bigger story than our naked eyes can grasp. Social networking sites tell us what we are interested in and to whom we are close, even when we are not aware of such information ourselves. Public data raise our understanding of the cities and societies in which we live to an unprecedented level. Public transit data tell us about the movements and daily lives of our fellow urbanities, and also about the state of the natural environment surrounding us today. Statistical data may loo like mere numbers, but these statistics necessarily tell something truthful about us as individuals, as communities, and as societies. The most interesting subject of the current project is identifying what projects Seoul as a city is undertaking today. 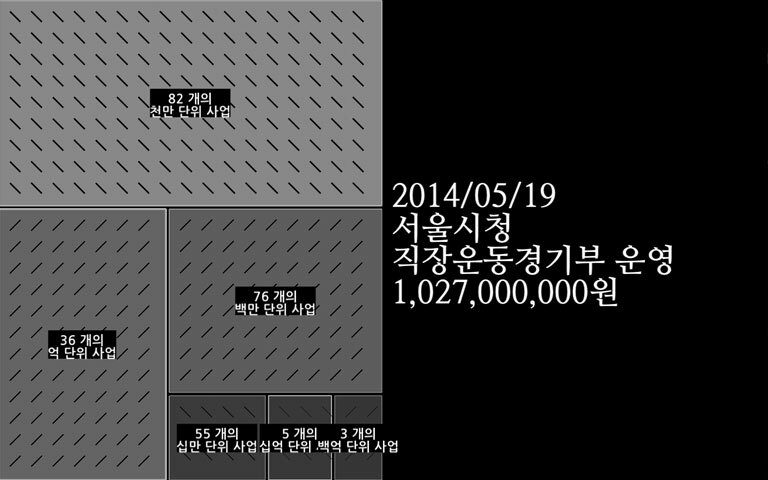 Visualization of Seoul’s projects by day, and by item and amount of expenditure, shows on what Seoul spends its money each day, and how it affects people’s daily lives. How Seoul looks to its citizens differs significantly, depending on the largeness or smallness of the spending and how the titles of the city’s projects strike citizens. 이 프로젝트는 도시 데이터 (공공데이터)를 통해서 도시를 이해하고 이를 통해 공공인식을 높히고자 한다. 공공데이터는 우리로 하여금 주변을 조금 더 깊게 인식할 수 있도록 한다. 대중교통 데이터를 통해서 도시민들의 이동을 알 수 있고, 대기오염 데이터를 통해서 한 도시의 공기와 환경에 대해서 인식할 수 있다. 개방형 정부의 발전으로 더 많은 공공데이터가 사용가능하게 만들어 지고 있는 요즘, 과연 어떤 데이터를 사용하여 시각화 하는것이 사회를 이해하고 공공인식을 높히는데 도움이 되는지 생각해 볼 필요가 있다. 이 프로젝트는 도시데이터를 활용한 시각화 프로젝트의 하나로, 서울시의 일자별 지출 사업과 금액을 보여줌으로써, 서울시민들의 이해도를 높히고 더 많은 질문과 소통이 시민과 시에서 이루어지길 바란다. This project was a long journey. 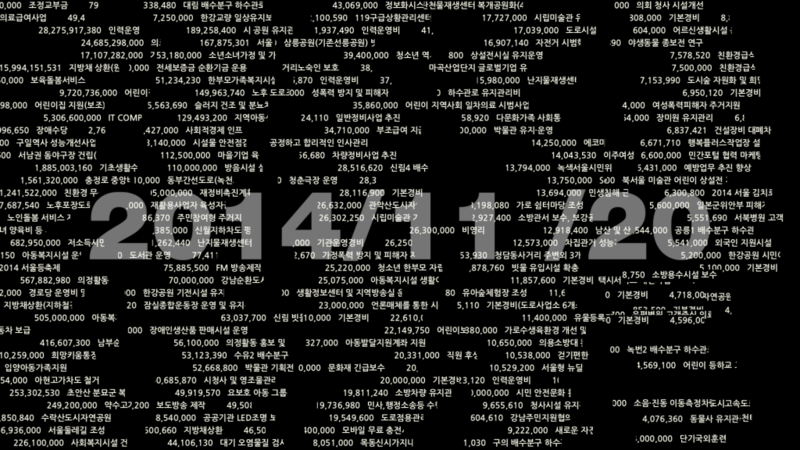 The first idea came out two years ago, right after Seoul released open API of city daily expenditure. After reviewing the feedings, we realized expenditure data was interesting as an individual form rather than a set or sorted group. Some of businesses are enough to stimulate citizen’s curiosity, which might lead further civic action. 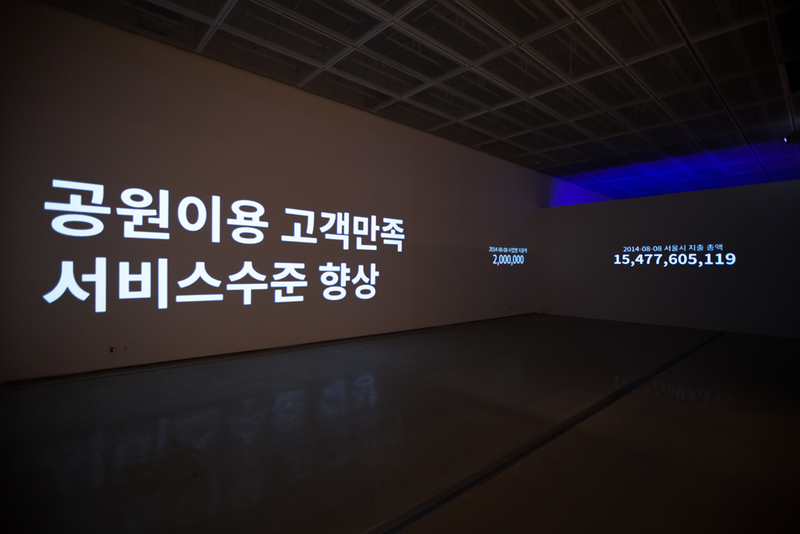 -데이터 시각화는 때로는 개별 데이터를 보는것이 더 흥미로울때도 있다. 이번 프로젝트에서 가장 흥미로웠던 부분은 바로 서울이 어떤 사업을 하고 있느냐였다. 따라서 시각화는 일자별 사업명과 해당 사업의 지출 액수, 그리고 단위별 사업을 구분하여 하루동안 서울시의 지출을 보여준다. 이를 통해서 시민들이 서울시에 관심을 가지고 사회적 행동이 이루어 지길 기대한다. 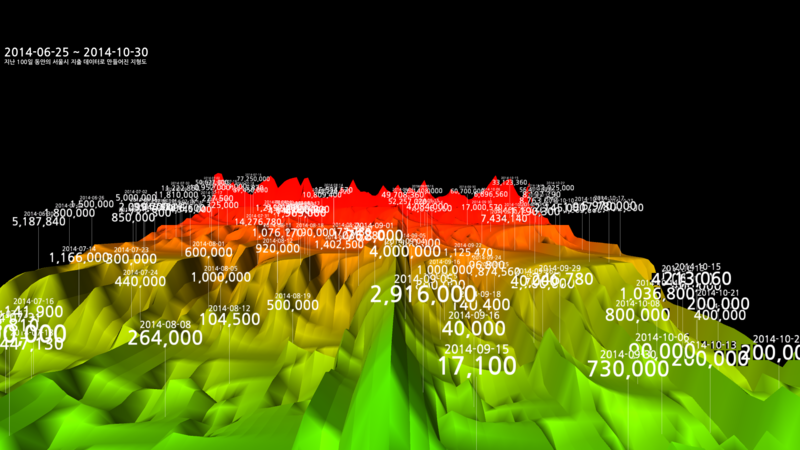 One of visual experiments is creating a landscape out of 100 day expenditure data. This landscape would stream Seoul’s expenditure tendency in realtime. 최근 100일간의 서울시 지출 데이터로 만들어진 지형도는 사람들에게 정확한 사업명과 지출액 보다는 최근 서울시의 지출성향을 볼 수 있도록 했다. By definition, public data must come to the public first. It should not be something that the public has to make an effort to look up on their smartphones or on the internet; rather, it should be information that the public can easily encounter even without making any particular effort to find it. 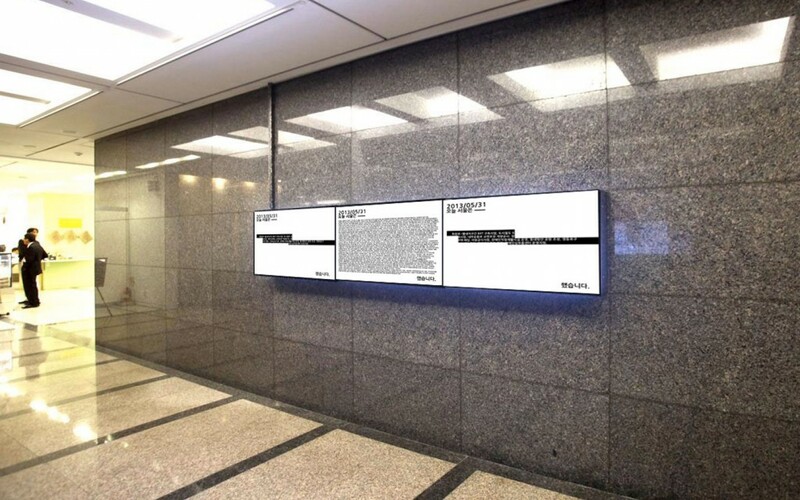 The most fitting medium to communicate public data and information is therefore the public screen. Public screens are commonplace sights throughout major cities like Seoul. As citizens wait wait for subway trains to arrive on station platforms, and as they walk past tall buildings with large screens in urban districts, they should be able to view what their city has done for them today, and how much of their tax money was spent to that end. - data will be updated everyday at 12:00 am. -The followings have been captured with 2014_05_19 data. © 2012, randomwalks all rights reserved.